Michele Siekerka is CEO and president of the New Jersey Business & Industry Association. 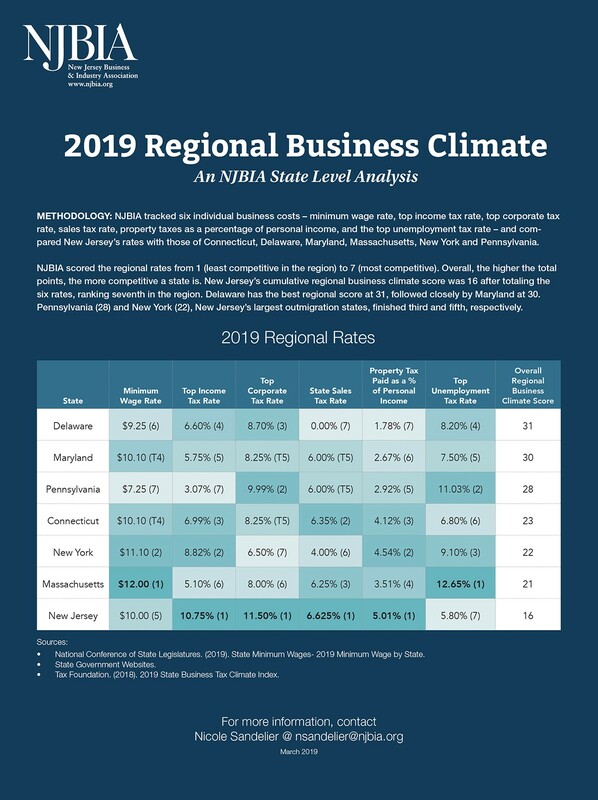 In Muoio’s own words, the revenue performance of the corporation business tax in fiscal year 2019 has been compelling. The revised CBT forecast has been increased $662 million, to a total of $3.7 billion for FY 2019 — a record revenue number for that tax. But that stands to reason when you own the second-highest CBT rate in the nation, the highest in the region, and when changes to the CBT included other tax provisions that we predicted would eclipse the scored numbers that policymakers projected. The result is a windfall of money to the general fund from New Jersey’s job creators. However, because over $500 million of this corporate revenue growth is nonrecurring, Gov. Phil Murphy’s administration’s new solution is to — what else? — increase taxes somewhere else; all while New Jersey’s current jobs numbers suggest a stagnation in job growth as we stare down a national recession within the next two years. Rather than do what is needed — structural reforms that will put New Jersey on track to a fiscally sound budget and pathway to a sustainable budget for the future — the call is to increase the state’s top Gross Income Tax rate for those making over $1 million annually. Structural reforms, like those included in the Path to Progress report, will help address the $151 billion in pension liability and post-employment benefit obligation, and long-term debt obligations that have grown 382 percent over the last 10 years. New Jersey’s top GIT rate is 10.75 percent. That’s the third-highest rate in the nation and the highest rate in the region by a long shot. This provision, quite simply, will continue our massive struggles in regional competitiveness, impacting New Jersey’s job creators who drive New Jersey’s economy. And let’s not forget that these same job creators are already coping with a barrage of additional costly workplace mandates, also resulting from the actions of this administration. New Jersey has a net loss of nearly $25 billion in adjusted gross income over the last 12 years, and the trend continues at a rate of approximately $3 billion per year. This is not anecdotal. This is IRS data. How can the answer be to exacerbate this situation by adding even more taxes to our already tax-challenged residents and businesses? A fairer concept would be to put the Path to Progress recommendations to work now: To transfer state and local government employees from the current platinum-level health coverage to gold coverage, comparable to what most of the best private-sector companies offer their employees; and to shift all new public workers at the state and local levels, along with not-yet-vested workers, from the defined retirement benefit plan to a cash-benefit plan, or hybrid retirement benefit. These reforms would greatly improve New Jersey’s fiscal challenges in the short term and the long term. They would serve as a much-needed alternative to the established and ineffective pattern of remedying budget imbalances with increased or new taxes on overburdened businesses and residents. ADP acquires Celergo, strengthens global payroll offerings	 The future needs to be female: Why aren’t there more women on ROI Influencers Power List 2019?